What better for your holiday than to be 7 minutes on foot from the beach, from your house! 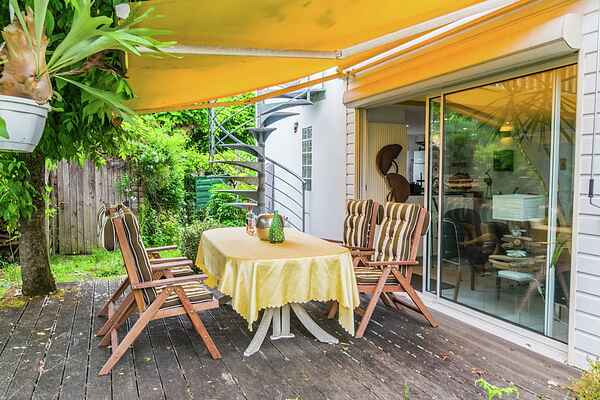 This charming detached house with garden is in a residential area of Andernos-les-Bains 15 minutes from the town centre. It has been tastefully fitted and provided with all the comfort you need, notably an equipped kitchen, terrace and deckchairs for sunbathing. It is nice to stroll in the garden or be on the terrace with a nice glass of wine and some oysters for which the region is well known. For your fresh croissants in the morning, the nearest bakery is on the street corner (50m). In the town centre you will find many shops and restaurants. If you go for a walk by the sea, do not miss the remains of the 4th century Gallo-Roman villa. Go on a kayak trip to bird island, the huts on stilts, the oyster parks or the beautiful nature reserve of Banc d'Arguin. Do not miss either Cap-Ferret lighthouse. The ocean and its beautiful waves are 10km away. Andernos-les-Bains is next to the famous Arcachon Basin. A modern seaside resort with a famous pier, which is more than 230 metres in length. This pier is one of the longest in France, and from its far end offers a splendid view of the unique landscape of the Arcachon Basin.